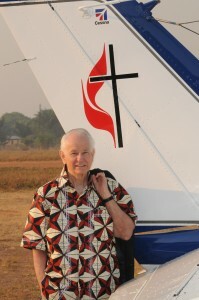 Joe Kilpatrick stands with the United Methodist missionary plane for a picture. Kamina’s dirt airstrip is in the background. teaching General Conference polity in many Episcopal areas of Africa covering the countries of Liberia, Sierra Leone, Nigeria, Congo, Mozambique, Kenya. Joe and Carole were married in 1961,are blessed with two sons, eight grandchildren, and one great grandson. 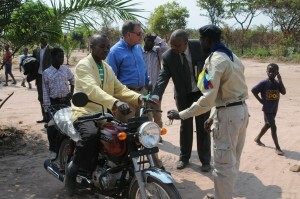 Crossville UMC provided a motorbike for Rev. 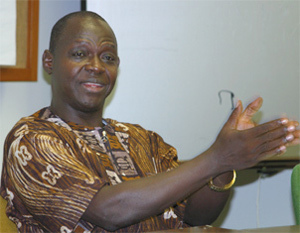 Kimba Evariste, President of the Kabongo Methodist University. Rurel is lead pastor of Crosspoint UMC in Niceville, Florida, a member of the Alabama-West Florida Annual Conference. While playing a key role in the dynamic growth of this congregation to mega-church status, Rurel finds time to serve Asbury Theological Seminary on their Alumni Advisory Council. He is married to Lisa, an ordained Deacon, teacher, missionary and writer, who serves on the OMS Board of Directors. Rurel appreciates the key role Africa’s UM pastors and laity have played in the UMC denomination and so he travels there annually to teach pastors and leaders in the North Katanga Episcopal Area of the Congo the practical ministry concepts developed by International Leadership Institute (ILI). in this very critical ministry of the church. The gift of Bicycles and Bibles will go a long way in enhancing the ministry of the church especially in the most remote and rural communities where trained and qualified clergy are less inclined to serve. Here in Sierra Leone, we train local pastors (Evangelists) and send them to these communities as pastors and church planters. These faithful men and women of God take the Gospel of Christ to unimaginable places – down the valleys, up mountains, across rivers. It is in this light that I most warmly welcome this important ministry. Yes, you can go ahead and raise the much needed funds for Bicycles and Bibles for Sierra Leone. Peace and Grace. Bishop John K Yambasu. The North Georgia Conference United Methodist Men blessed Bikes and Bibles, Inc at their 2017 Annual Business Meeting by voting to invest $1,400 in eight bikes and bibles for African pastors. Toney Griffin, President of UMMen for the College-Park District is leading the UMMen work with Bikes and Bibles encouraging more men’s ministry groups to adopt it as a project. 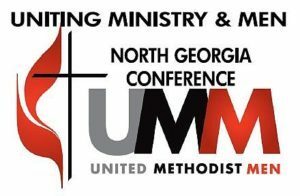 This follows the strong support from the UMMen of Tucker First UMC in North Georgia’s Atlanta-Emory district. The men there have sponsored annually a Pancake Breakfast, offering free food in exchange for donations to Bikes and Bibles. They typically raise $500 to $1,000 every year for this ministry. Thank you UMMen of North Georgia!